Special Containment Procedures: SCP-2208 is to be kept in a Level 4 secure storage locker in Site-57. Personnel wishing to access SCP-2208 must obtain permission from the Site Director. Instances of SCP-2208-A are to be cataloged and placed in non-hazardous storage.1 Full-body protection must be worn at all times when testing SCP-2208. Description: SCP-2208 is a 2-quart ██████-brand stainless steel saucepan. 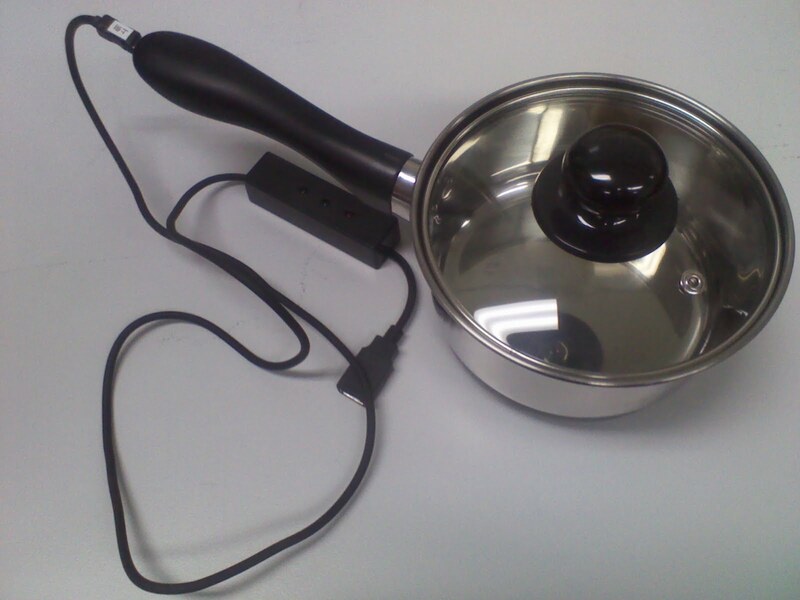 The inside is coated in a nonstick polymer believed to be polytetrafluoroethylene.2 The handle has been modified to include a USB standard-A receptacle, the purpose of which has yet to be determined investigation of which is pending.3 SCP-2208 does not transfer heat as a stainless steel saucepan should, and heat testing up to 2,300°C has been unable to warm its surface. When a human subject makes skin contact with any part of SCP-2208, there is a 29% chance the subject will be transformed into a saucepan (SCP-2208-A) in a process that takes ~0.8 seconds. Instances of SCP-2208-A match SCP-2208's appearance, apart from the lack of USB receptacle; they are otherwise non-anomalous. Subjects unaffected by initial contact with SCP-2208 are able to safely handle it thereafter.4 A predictive pattern of SCP-2208's effects has yet to be determined. Foreword: SCP-2208 was recovered from the home of J██████ Nuñez of Westway, Texas, USA, along with 145 other saucepans believed to be instances of SCP-2208-A. The home was raided after a four-month federal investigation into the disappearances of more than ███ individuals from the area. Foundation agents embedded with the FBI were alerted to SCP-2208's anomalous properties after 3 federal and 1 Foundation agent were converted into instances of SCP-2208-A. The object was recovered by a federal agent immune to its effects, and Ms. Nuñez was questioned by the Foundation. Interview translated from Spanish. Agent Alvarez: What can you tell us about the saucepan we recovered from your home? The one that transforms people. Ms. Nuñez: God created man in His own image. Agent Alvarez: I don't understand. Ms. Nuñez: God does not make mistakes. Agent Alvarez: I don't know what you mean. Maybe you can explain why you haven't been changed? I'm sure you've touched it. Is there a reason why some are changed and some aren't? Ms. Nuñez: You and I, we are unworthy. I brought more and more faithful to him, yet still am I forsaken. [begins to cry] Why am I not worthy? Agent Alvarez: Make sure you tell the Bureau about that later. [pauses] Are you sure you don't know anything more about how it works, or why? Ms. Nuñez: God does not make mistakes, Mister Agent. If God were to change, His image would change, also. Closing Statement: Ms. Nuñez was remanded to FBI custody after a standard containment period and administration of amnestics. She cooperated with authorities in locating the remains of the ███ individuals not accounted for by SCP-2208-A instances and was charged in their deaths. Addendum 2208-02: On ██/██/20██, while performing routine testing on SCP-2208's USB receptacle, Junior Researcher L███ was simultaneously recharging an MP3 player via USB on the test computer, in violation of testing procedures. After testing was complete, Junior Researcher L███ discovered a new file on his device, named "un_w721g.mp3" and remanded his MP3 player to custody for study. A transcript of the audio file follows. Ow! What? What's this? Hello? Is that you guys? Listen, I haven't had anything to work with in like two months. Is that why you missed my last couple paychecks? It's been a while. I'm not a charity here! I've got expenses! And all these other people you sent in, they're starting to smell. It's been a while. Look, either you get me some new material, you pay me, or you find yourself a new employee. Once I figure out how to get out of here, anyway. It's been a while. Containment procedures are currently under review. 1. Next of kin are to be informed of death and loss of remains per Foundation Ethics Protocol 283-A-5: Family and Survivors With Unrecoverable Remains. 2. Marketed as "Teflon". Materials testing has not been possible. 4. For a list of personnel immune to the effects of SCP-2208, reference Document 2208-02-b.